Of course our most popular summer sport at Tornado’s is fishing! Many possibilities exist for your angling adventures. At our Main Lodge, you can travel the 40 mile Pickerel River waterway in pursuit of walleye (pickerel), northern pike, and small and largemouth bass. At Smoky Lake Lodge, superb small and largemouth bass fishing can be had, along with northern pike. Due to our active promotion of Catch & Release, Smoky and its surrounding waterways remain well-stocked with fish! 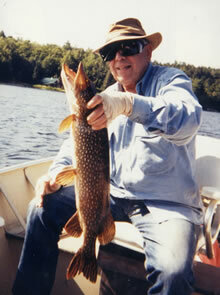 You will find northern pike and small and largemouth bass at both Portage Lake Lodge and Straight Lake Outpost. Portage also boasts a walleye population. For more detailed advice and tips, click on each lake separately.